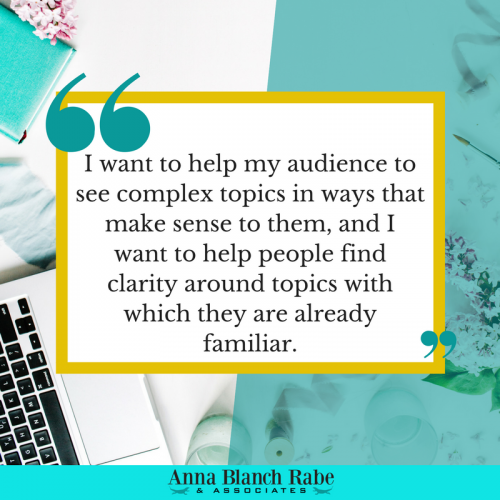 Anna Blanch Rabe & Associates provides specialist Legal Writing for Law Firms, Attorneys, and businesses that are marketing to clients in industries where legal issues may arise. Our informational content helps Businesses and law firms educate their clients about legal concepts in a general manner. We take complex and complicated subject matter and communicate clearly in accessible articles and columns that can be used in web and print media communications with clients and potential clients. Wouldn’t it be great if you had turn key content for your website, your company blog, or your client newsletter (or even a regular local newspaper column)? The Content Marketing Institute reports that 91% of B2B marketers use content marketing to promote brand awareness. Content Marketing is a great way of build brand trust and awareness. It allows you to serve your client base and potential client base in an ethically consistent manner! Finding a communications professional who can expertly and strategically navigate your niche, recognizing any potential ethical pitfalls for attorneys, and adding value to your website and helping you to provide your clients, and potential clients, with quality and specialist content might be more difficult than finding a diamond in a sand dune. But for the legal professionals who have chosen Anna Blanch Rabe & Associates to assist them in developing evergreen content, it’s like finding the motherload of precious stones! Our CEO, Anna Blanch Rabe, brings a diverse background to communications consulting. She has worked variously in higher education, publishing, event management, and non profit organization executive leadership. She holds a Master of Arts in English Literature from Baylor University, as well as holding a law degree from the Australian National University. Her unique set of experiences and skills allow her to understand nuances in adding value to the clients of your business while understanding the ethical limitations of writing about legal topics (as a non-practising attorney). We have a team of skilled writers with law degrees ready to create high quality client facing educational & informational content! Your time is valuable! We want to help you help your clients make effective use of your time! We want to help you execute a legal content marketing strategy which attract more high qualified clients who need the services in your practice area(s). All of our skilled writers and researchers have law degrees and can provide informational content relating to US State and Federal Law, Canadian Law, Australian Law, New Zealand Law, and the laws of the United Kingdom. We are looking to expand the jurisdictions we write about, so please ask and we’ll do our best to accommodate you at the high standard we deliver for all our clients. Here is an article about our work with one of our attorney clients who works with service businesses. We would be happy to send you writing samples of the kind of work we could deliver to your company with full search engine optimization, keyword identification that mirrors your broader brand communications strategy, and strategically matches your company’s brand voice. Ultimately, we are your go-to specialist for content to employ in your content marketing strategy for your law firm or business! We do all the technical stuff, make sure the content is accurate and accessible, and can even deal with your blog back end and upload the content for you! We produce high quality content, all the while making sure that we reinforce the information benefit to your clients leading to building a relationship of trust, and an increase in your firm’s brand reputation as a practice area expert.